BRACKNELL, UK. 31st January 2019 ? 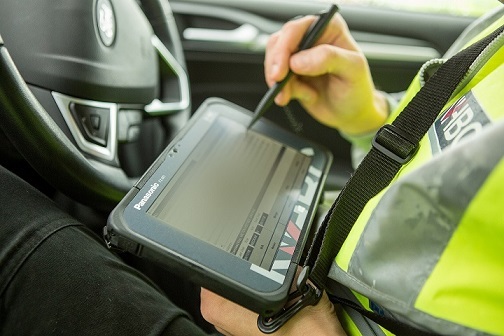 NHBC, the UK?s leading home warranty and insurance provider, has equipped its Building Inspectors with rugged Panasonic TOUGHBOOK M1 tablets for use during construction site visits and home office working. ?The new devices needed to be tough enough to stand up to the harsh environment of the building site, lightweight to be carried around and have a clear screen for use outside,? explained Chris Borah, NHBC Programme / Project Manager. ?We also wanted a device running Microsoft Windows operating system ? rather than Android – to be compatible with our systems and applications.? After short listing, two devices were tested on-site and in the office with Building Inspectors and NHBC choosing the Panasonic rugged tablet. ?It was much lighter, smaller and easier to carry for the Inspectors,? said Chris. ?The performance of the device and the fact that it had its own docking station for use with a keyboard and screen also made it ideal for the Inspectors to use as a desktop at home.? ?The Panasonic device has given our Building Inspectors a single mobile computing device that is designed for their needs and future-proofed to grow with the organisation,? said Taz Johal, NHBC Senior Programme Manager.